The cycle route, mainly along quiet country roads, takes in three villages situated on the edge of the Vale of Belvoir and also a long stretch along the Grantham canal towpath. 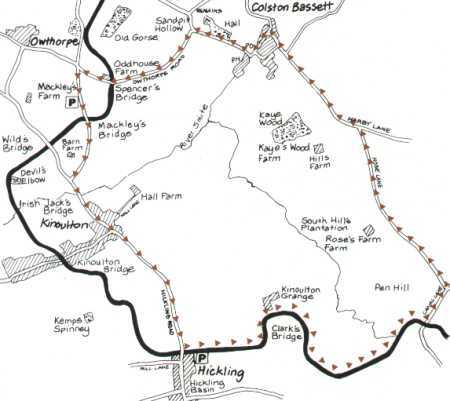 Although the route can be started at a number of diferent locations, the description for the ride starts at Hickling canal basin. From Hickling Basin, go through the two small hand gates onto the towpath heading eastwards. Care must be taken when cycling on the towpath, for although it is wide enough to cycle along in safety, please slow down when walkers are met and do not cycle too near the canal edge. Continue along the towpath until the brick built Clark’s Bridge is reached. Please dismount to go under the bridge as the towpath narrows quite considerably. Go on until Long Clawson Bridge and up the access track to the road. Turn Left onto the road and follow this quiet country lane for about 3km to the T junction onto Harby Lane. The Nottinghamshire and Leistershire County boundary goes along this road for a short section. Look out for roadside nature reserve markers on both sides of the road indicating a special mowing regime of the grass verges to encourage native wild flowers. Some of the more recognisable species include Medow Sweet, Yellow Rattle, Lady’s Bedstraw and Rest Harrow. Turn left at the T junction and follow the road into Colston Bassett, passing the Stilton Dairy on the left hand side of the road at the start of the village. Continue along the main road through the village passing the village church, the Martin’s Arms pub and finally, Colston Bassett Hall. Turn left at the next junction (signposted Owthorpe and Kinoulton) and after 1km, the road crosses over the canal at Spencer’s Bridge. Just after the bridge is Oddhouse Farm with its date built into the brickwork. Turn left at the crossroads and go down the road that heads south to Mackley’s Bridge – another canal crossing. From the bridge, continue along the road to Kinoulton. Look out for the line of poplar trees that lead up to the canal at Irish Jack’s Bridge. Carry straight on at the Kinoulton crossroads passing the Nevile Arms on the right hand side. The route continues along the Hickling road leading back to Hickling Basin at the start of the ride.